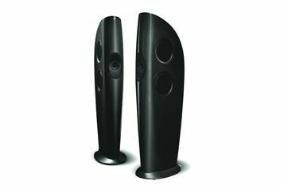 BRISTOL SHOW 2010: First UK demo of KEF Concept Blade speakers | What Hi-Fi? Three years in development, the Concept Blade showcases KEF's technical expertise and is seen as a precursor for future speaker designs. At the heart of the Concept Blade is KEF's Single Apparent Source technology, using a tenth-generation KEF Uni-Q midrange driver and tweeter. This results in "a loudspeaker with unrivalled coherence across the frequency range", claims KEF. Every component in the Concept Blade has been designed "from the ground up", including the four side-firing 25cm bass drivers. They're arranged in opposed, symmetrical pairs to let the forces of each cone cancel each other out. Apparently the force produced by the bass drivers is so strong that the massive rear magnets have to be bonded directly to each other. The Uni-Q uses a 25mm titanium-dome tweeter carefully positioned so that it has the same acoustic centre as the midrange driver. The cone itself is formed from liquid crystal polymer – a light but extremely stiff material – and backed by a 7.5cm voice coil. All this technology is housed in a curved cabinet made from a carbon fibre, balsa wood composite similar to that used in high-performance cars. Visit the Bristol Show this weekend to meet the KEF engineers who worked on the project and be one of the first in the UK to hear the groundbreaking Concept Blade speakers in action. For full details of the Bristol Show 2010, see our special blog.